Beginning cooks might not know how versatile a knife can become in the hands of a professional chef. Anyone who doesn’t know the differences between knife skills such as mincing, dicing, and chopping has quite a bit to learn. Luckily, it doesn’t take long to start learning these skills. Just because you’ve minced a few onions, however, doesn’t mean that you know how to do it properly. These are skills that chefs spend years perfecting. Mincing gives chefs finely cut chunks of an ingredient such as onions, garlic, or squash. The proper mincing technique varies slightly depending on the ingredient, but cooks can adjust their techniques easily when encountering new foods. 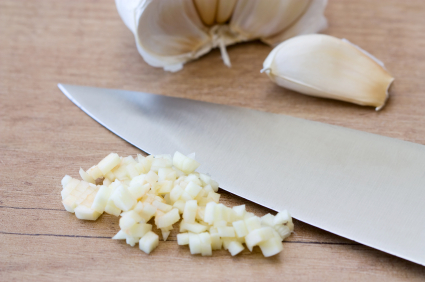 To mince garlic, use a knife with a thin, sharp blade. Cut the garlic into strips, running from the head to the root. Turn the strips at a 90 degree angle and cut them into small pieces. Chopping is a versatile technique that works well with a chef knife or a cleaver. Hold the cleaver’s handle securely and place your other hand on the top, dull side of the blade. This lets you control the cleaver easily so that you can create large or medium chop sizes. Dicing is a subcategory of the chopping technique. The major difference is that dicing creates small chunks. Chefs can use smaller knives for this technique, although experts could still dice with cleavers. Regardless of the knife, having a Granton edge helps create smaller, even cuts. If you need to hold the ingredient while dicing it, be sure to use the “claw hand” technique. This reduces the risk of injury by removing your fingers from the dicing area. Julienning creates long, thin strips. This technique is most commonly associated with cutting vegetables, but chefs can translate the skill into techniques used when preparing ingredients such as fish, meat, and cheese. To julienne properly, use your middle, ring, and pinkie fingers to grasp the top of a chef knife’s handle. Your forefinger should rest on one side of the blade while your thumb provides support from the other side. Use the knife to cut off four sides of the ingredient. This will create a block that is easy to work with. Now, cut the ingredient into uniform, lengthwise sections. Do not “chop” straight down. Instead use a rocking motion that allows the knife’s blade to move easily through the vegetable or other ingredient. Stack the sections on top of each other and use the same technique to cut them again. This should produce long, slender cuts of the ingredient. “Chiffonade” is a French word that means “made of rags.” Chefs primarily use the style when cutting herbs such as basil or mint. 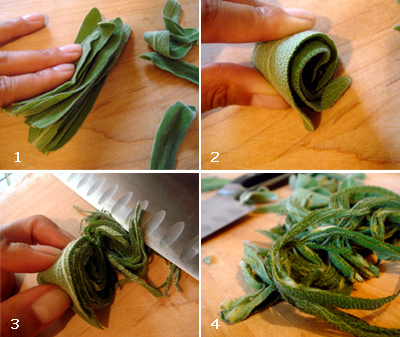 To chiffonade basil leaves, stack the leaves on top of each other and roll them into a tube. It should look like a green cigar. 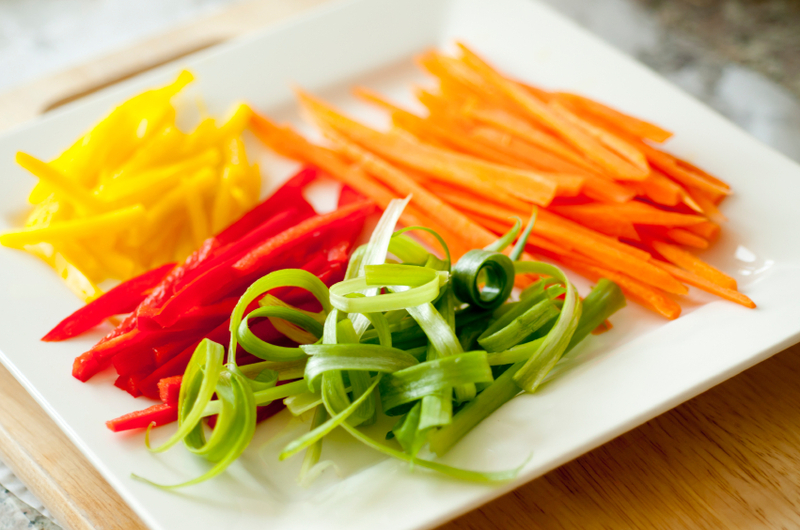 Use an extremely sharp knife to cut the leaves using the same rocking motion from the julienne section. This will create short shreds of the herb, making it perfect for adding flavor to dishes. 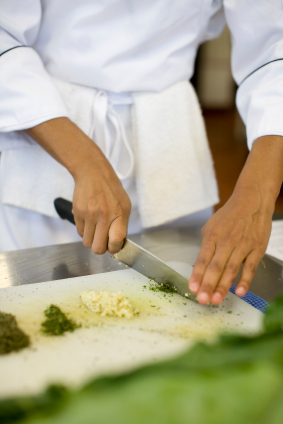 These basic knife skills can make cooking easier and safer. Learning how to use them properly is an essential step for every chef.